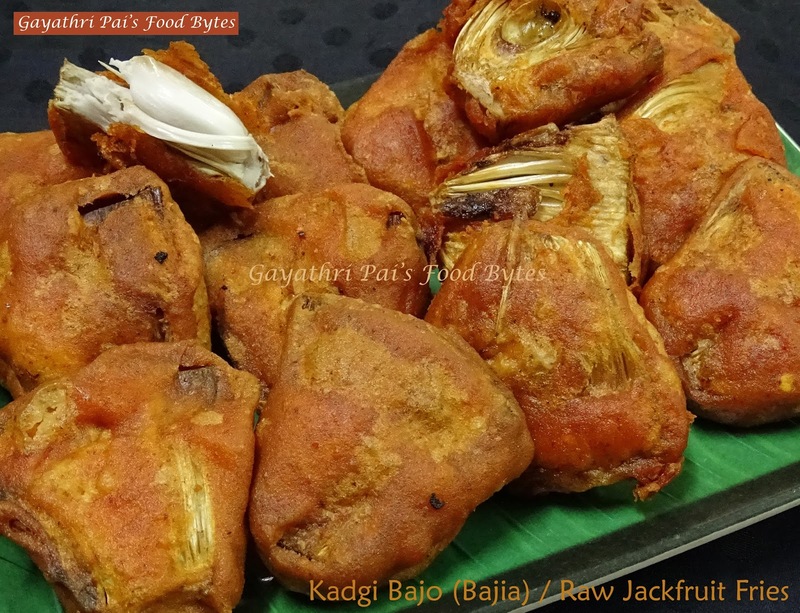 Gayathri Pai's Food Bytes: Kadgi Bajo (Bajia) / Raw Jackfruit Fries. ** Kadgi / Raw Jackfruit is abundantly available almost all round the country during from the month of December to March. In Mumbai it is available almost till June though after March the one’s available are sometimes overgrown or not good texture wise ie not tender enough for podi / bajo / fries. There are many dishes that can be prepared out of Kadgi and I have posted many of them before. Podi is also a dish which I have posted before and will be sharing its link at the bottom of this recipe. Most often I prepare podi out of the very tender raw jackfruit as my husband loves these fries. We do get small raw jackfruits which are very tender and cook too fast and these are the one’s that are most preferred for preparation of podi. ** For the preparation of podi or bajo the raw jackfruit has to be tender without the inner flesh going too thready or the inner seeds having outgrown. 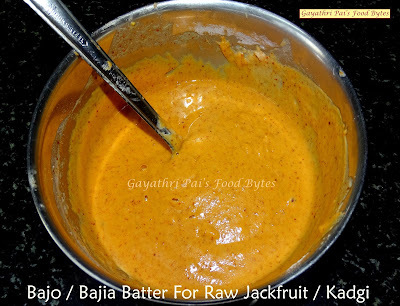 If the raw jackfruit is not very tender then the podi / bajo becomes a bit chewy and is not pleasant to munch on. My Mom used to use very tender one’s as they are available in plenty in Mangalore. Though we do get them here, I have to buy them in full, which is too much for my usage. Hence many a times I do not get choice on buying of the raw jackfruit and have to do with whatever is available. Many have queried if it is absolutely necessary to precook them before frying. Well, If they are tender there is absolutely no need of boiling / steaming / cooking them before applying masala to deep fry them. But yes, if they are not then steaming or boiling them for a few minutes will keep them soft within and crisp outside. ** My Mother never bothered to cook them and straight away fried them as in my Mom’s place we loved them crisp / kurkuri. After marriage my husband too prefers it crisp so many a times I just forgo the step. But if the jackfruit purchased is not very tender, then I do wrap them in a cloth and steam them for 3-4 minutes before applying masala and then deep fry them. This step though I might have followed say once of twice in 30 yrs of my cooking spree. I am only blogging it for the help of those who need not fret if the raw jackfruit is not tender and is chewy in which case they can adapt this method and then follow the rest as given below. This keeps the jackfruit soft within and crisp outside. But if the seeds of the raw jackfruit is large, then plz. do not use the same in making podi / bajo as the outcome is not at all good. ** As I have already mentioned before in my other recipes, In my locality we get the raw jackfruit all cleaned and cut into huge chunks while purchasing. However, if you do not get it cleaned in your place, just slice off the spiked skin portion of the jackfruit and the center pith and then cut them to triangular pieces of half-inch thickness and around 2.5 to 3 inch width sizes. You can check up on the picture posted. Also, see to it that you oil your hands and the knife as jackfruit is sticky and has a rubber like liquid oozing out while cutting the same. Cut them into pieces. If at all the gummy portion sticks to knife do not worry, just hold the knife part on top of flame careful and let it become hot, now wipe with a tissue and it goes off easily. But do be careful when you do it. ** Wash the sliced pieces, drain off all excess water, pat them dry apply some salt along with a pinch of red chilly powder and keep it aside ready to be deep fried. In all I had about 15 pieces. ** Note : If the Jackfruit pieces are not very tender. You can wrap them in a cotton cloth and steam them for 4-5 minutes in a pedavan / Idly steamer. Remove and allow to cool properly before deep frying them after dipping them in batter. This step is optional and you may follow if you want the bajo to be soft and not very crispy. But I repeat if the jackfruit is very tender there is absolutely no need to steam them as they will get cooked well on deep frying. ** In a stainless steel bowl add in 3 tblsp of rice powder, 1 tblsp of besan (Chane peetHa / Bengal gram flour), 1 tblsp of kashmiri red chilly powder, ½ tsp of hing powder, ¼ tsp of tamarind water (Optional) and salt to taste. Mix this well. Now add in enough water to make a very thick batter. The batter should be slightly thicker than the normal bajia / bajo batter for the batter to coat well to the raw jackfruit. ** Heat plenty of oil in a thick bottomed pan to smoking point. Once it reaches the level, lower the heat to medium and wait for 3-4 minutes before you add in the fries. The oil should niether be too hot, which may burn the outside of the bajias nor too cold which will make the bajias soak in oil and become oily. For checking the correct temperature, you may add in a drop of the batter into the oil. If it sinks to the bottom and then rises up sizzling and starts floating on top without sinking the temperature is correct, you may proceed with deep frying. ** Dip each pieces into the fire, coat evenly on all sides and slide them carefully into the hot oil. Repeat with a few more pieces. Do not overcrowd the kadai there should be enough place for the pieces to get fried evenly. Also addition of too many pieces, brings down the heat level of the oil and makes a mess out of the fries. You have to keep the heat level of the oil constantly at the same temperature. So fry the pieces in batches. ** Keep flipping the pieces a few times as it cooks on hot oil, to evenly make it crisp fried. Once it is evenly browned and is crisp remove it out with a ringed spatula so that the excess oil falls back into the kadai, stain off as much as possible and then put them on an absorbent paper for the excess oil to get drained. Continue the same procedure with the remaining pieces of jackfruit by dipping them in batter and deep frying. ** "Kadgi Bajo (Bajia) / Raw Jackfruit Fries" is done and ready to be served. Serve them hot as a side dish along with other items during lunch / dinner time or you can also relish them as a snack during tea break by dipping them in some tomato ketchup. Frankly you can enjoy them anytime of the day when friends drop in. They really taste yummy. Do try out and enjoy these bajos / bajias with your family and friends and do give me a feedback if possible. ** Here is the link to the Recipe of Raw Jackfruit Podi / fries ….